Large design of a castle silhouetted against a bargello stitched rainbow of colors with the moon shinning through the towers. This chart pack contains 9 designs including Sparkling Castle, Midnight Visit (Unicorn and Castle), Guardian of the Castle, Childhood Sweethearts (Two Unicorns), Dragon and Cave, Midnight Castle Mini Unicorn. Many of these designs use many metallic threads. Clowns from all kinds of professions and hobbies include - banker, astronaut, golfer, lawyer, gardener, veterinarian and a King. Come with Me Chart pk. Night scene with starchildren, elves and a big lion walking through the enchanted forest. Metallic threads add a sparkle. 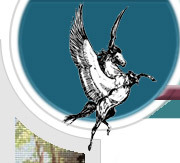 Starchildren walk through the snow covered enchanted forest as the faint image of pegasus can be seen watching over them. 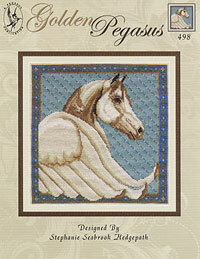 The Pegasus featured in this leaflet is the one we also use for our logo. 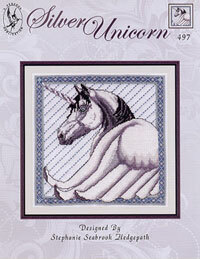 The Unicorn design is also icluded. Both designs are stricking when done on black fabric. Cute and comical Clowns from the paintings of Jody Bergsma.